Korean heartthrob actor Park Bo-gum will serve as the emcee of KBS 2TV's Music Bank in Hong Kong, set to be held early next year, the broadcaster said Friday. Park was the emcee of the South Korean music show Music Bank's 2018 world tour concerts in Singapore, Jakarta, Chile and Berlin. 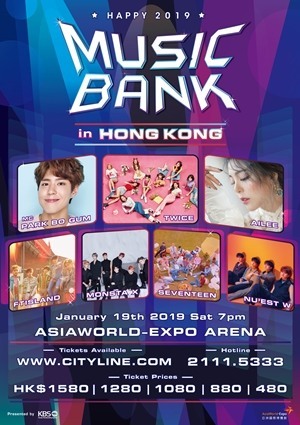 Among the headliners of the upcoming live show at Hong Kong's Asia-World Expo Arena on Jan. 19 are TWICE, Ailee, FT Island, Monsta X, Seventeen and NU'EST W.
The Music Bank World Tour will be broadcast to 117 countries through the KBS World channel.